The Pinwheel Galaxy (also known as Messier 101) is a face-on spiral galaxy distanced 25 million light-years away in the constellation Ursa Major. M101 is a relatively large galaxy compared to the Milky Way. With a diameter of 170,000 light-years it is nearly twice the size of the Milky Way. 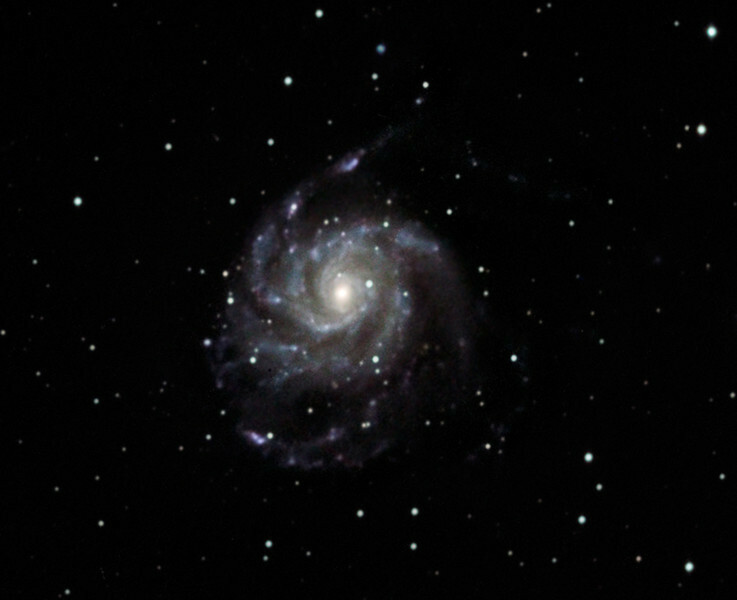 M101 can be seen to be asymmetrical on one side. It is thought that in the recent past (speaking in galactic terms) M101 underwent a near collision with another galaxy and the associated gravitational tidal forces caused the asymmetry. In addition, this encounter also amplified the density waves in its spiral arms. The amplification of these waves leads to the compression of the interstellar hydrogen gas, which then triggers strong star formation activity.